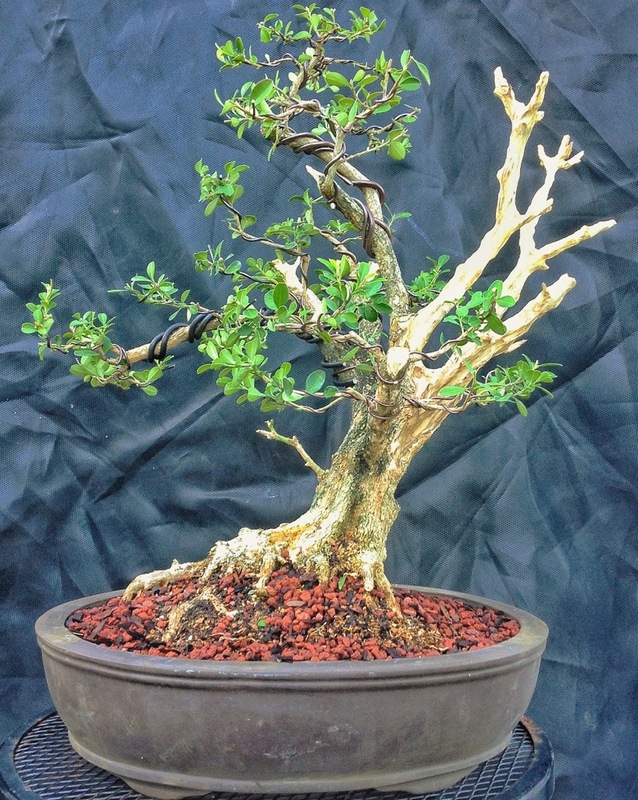 I think I’ll do a post on the lowly boxwood. 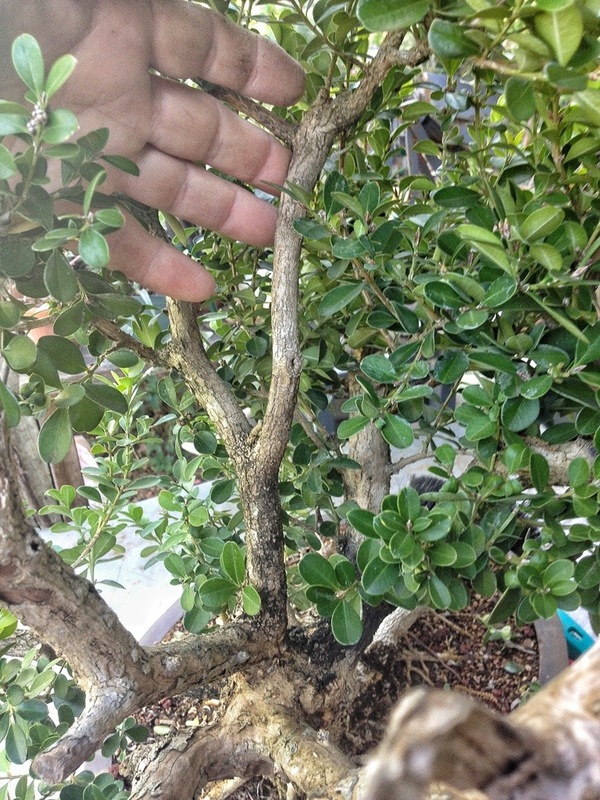 Boxwood are very easy to take care of; their watering needs are moderate, potting them into bonsai containers is achieved using a saw and some scissors (the root mass is very dense and requires very little root raking) and the growth is not too fast to keep up with. 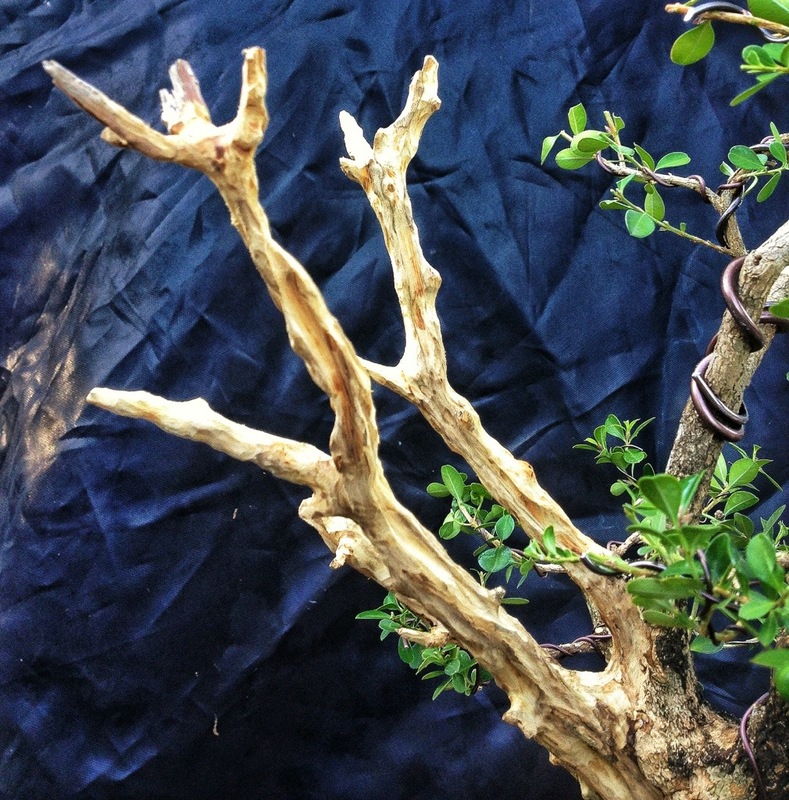 They’re underused by more advanced bonsai-ists because, as beginners, their initial tree gets hacked up trying to fulfil the “cookie-cutter” approach to bonsai (with the #1 branch #2 malarkey) either by them (with the help of not so helpful books) or by another person who “knows how” and offers them help. 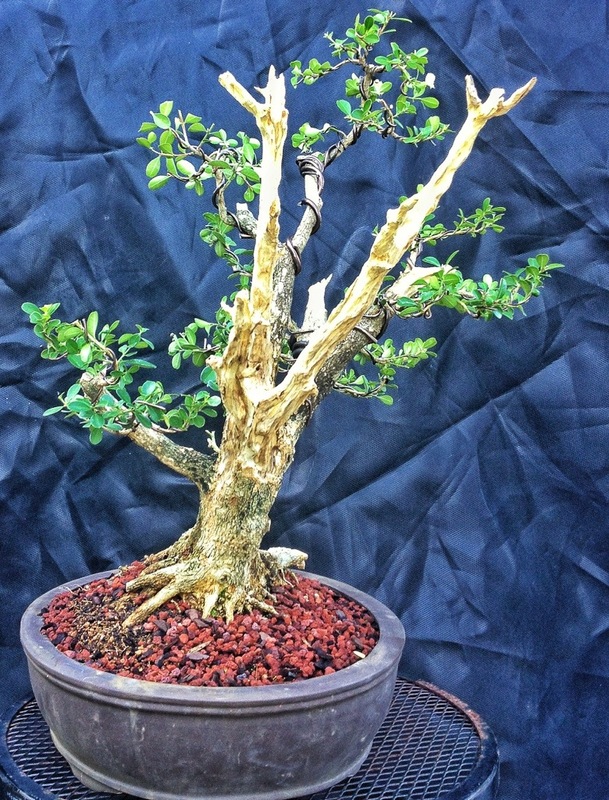 This, then, acts in destroying that original allure the boxwood had, replacing it with disgust at this slow growing, skeletal, funny looking shrub with funky balls of foliage at the tips. My first advice; don’t cut everything off. 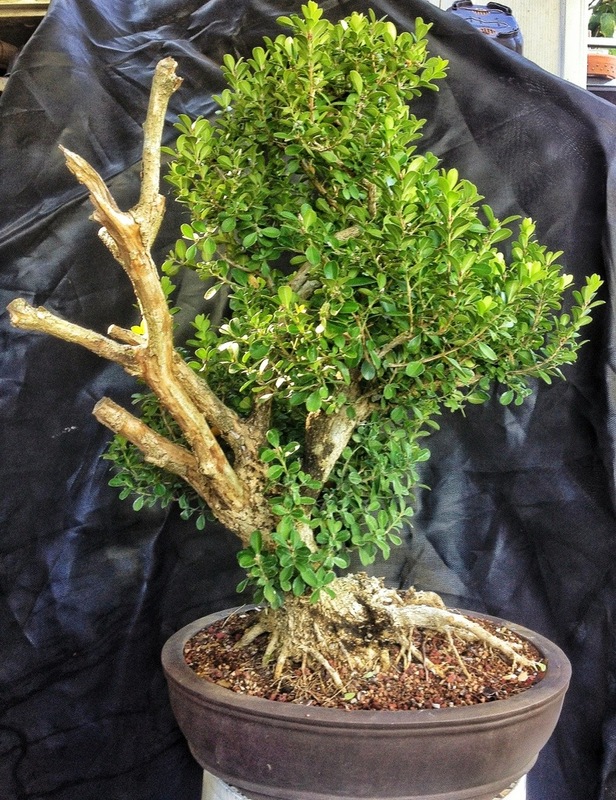 The boxwood is like a juniper, if you remove all the green on a branch, that branch is prone to dying. 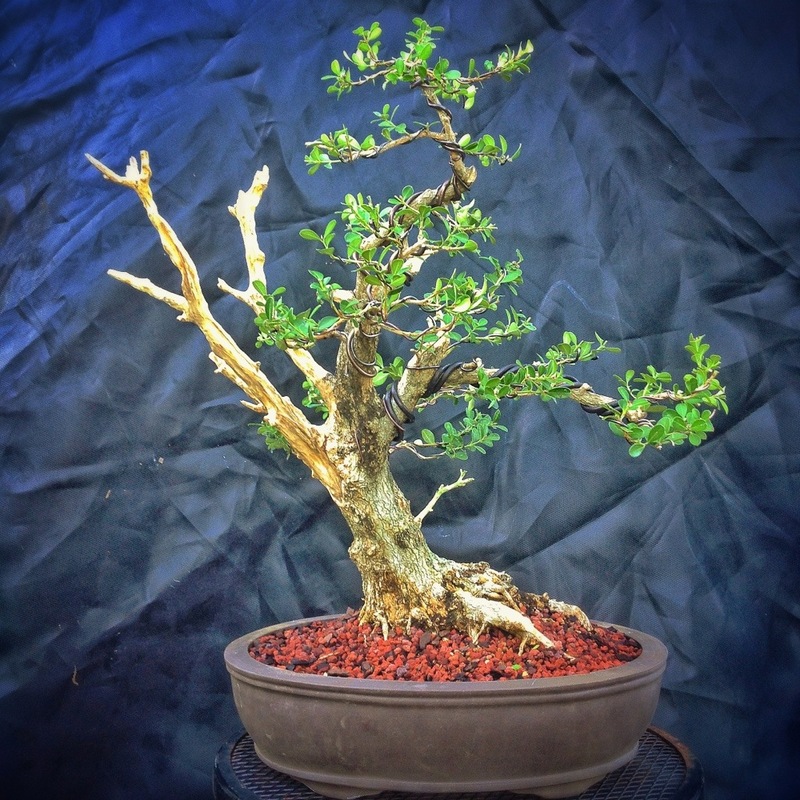 And a boxwood is very slow to grow. It’s better to try to use what’s there than to try to grow new branches. The boxwood is again like a juniper in that you will have maybe only two trimmings a year. 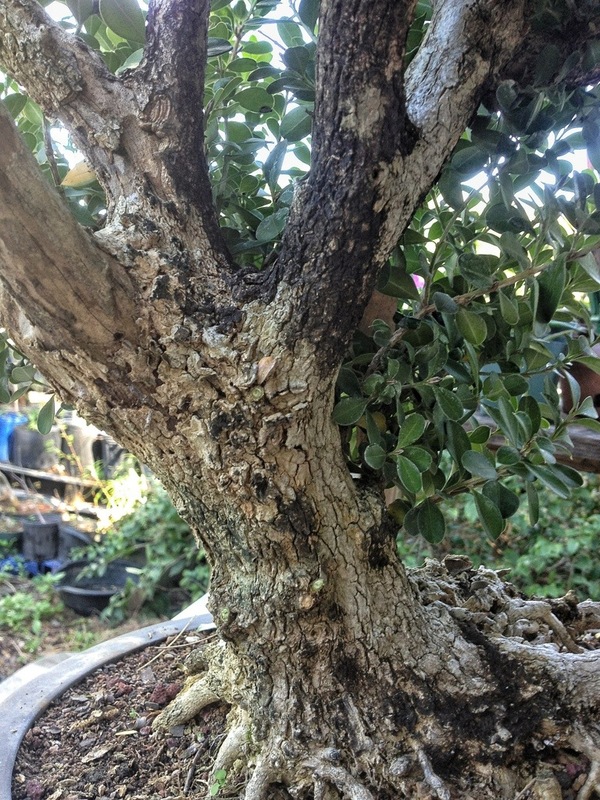 If you need to fiddle with your tree more than that, don’t get a juniper or a boxwood, try a ficus. Which we will call the “poodle tail” style. 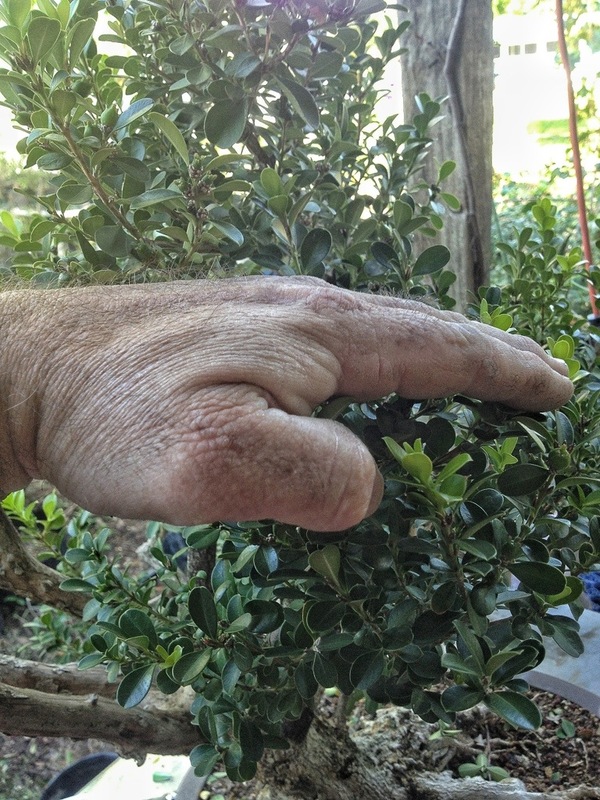 This buxus (japanese boxwood, buxus microphylla japonica) does not bud back well at all. It’s important to keep interior branching until you are sure you don’t need them. 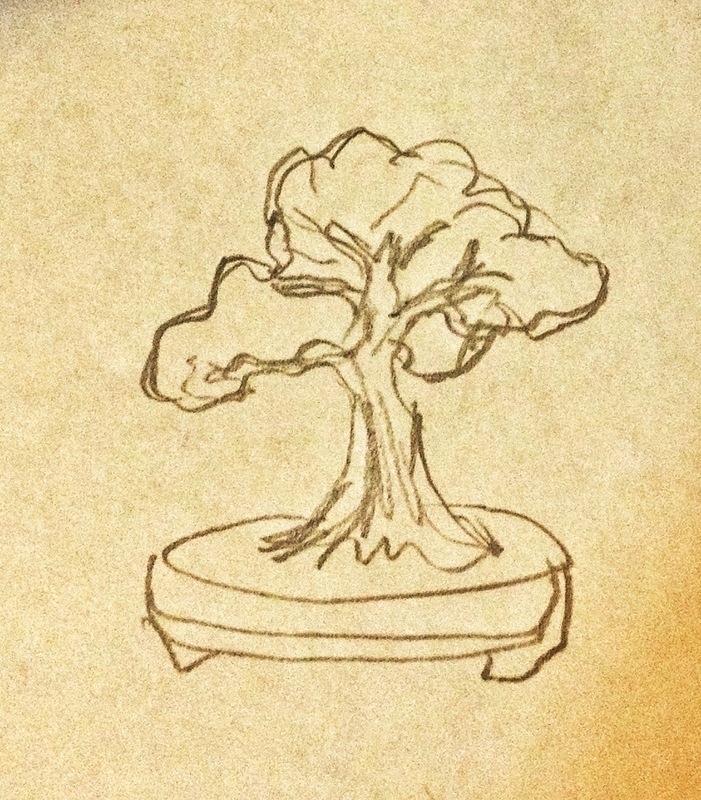 It’s more natural and tree-like than the stylized and typical Bonsai tree. That’s not to say that you can’t do something different but its best not to try to force a tree into a style it’s not suited for. 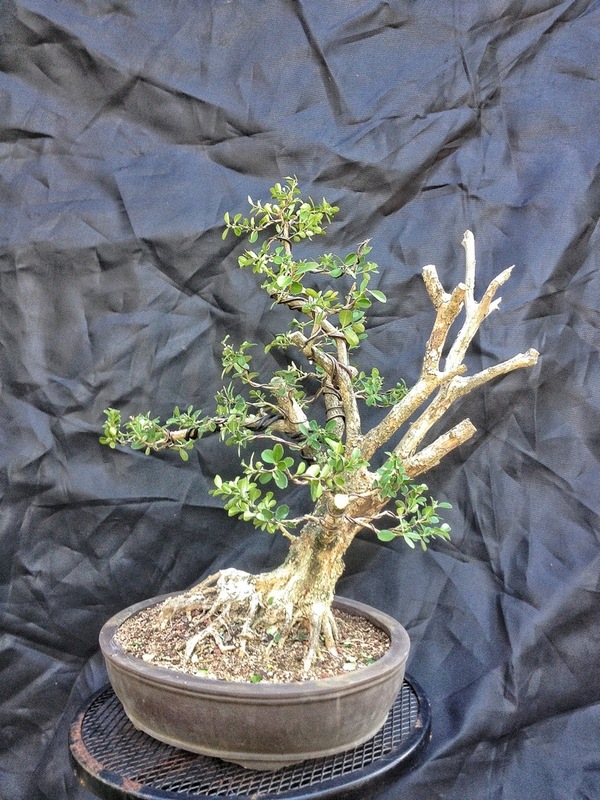 This boxwood needs wire but it’s styled as a nice pine-tree looking bonsai. It is uncommonly large; not to brag or anything. 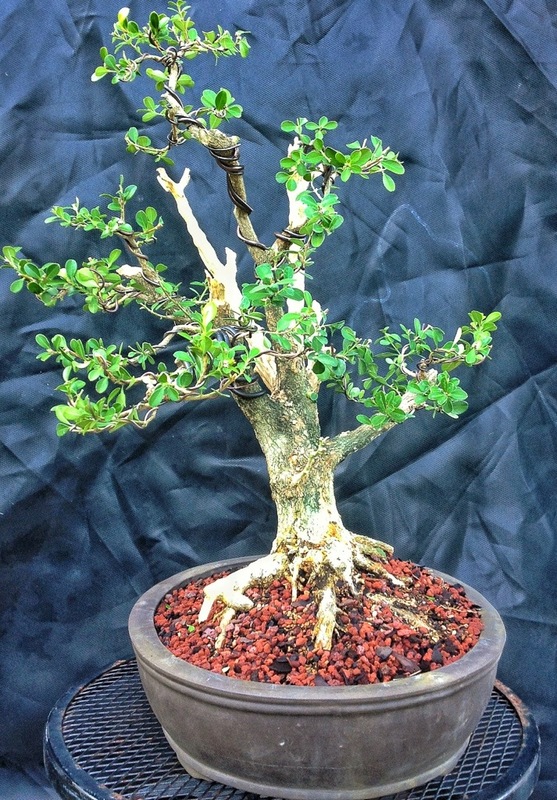 Most boxwood are small, maybe an inch thick. About 3 or 4 years ago I cut back the branches and then left the tree to grow. The foliage has filled in nicely. 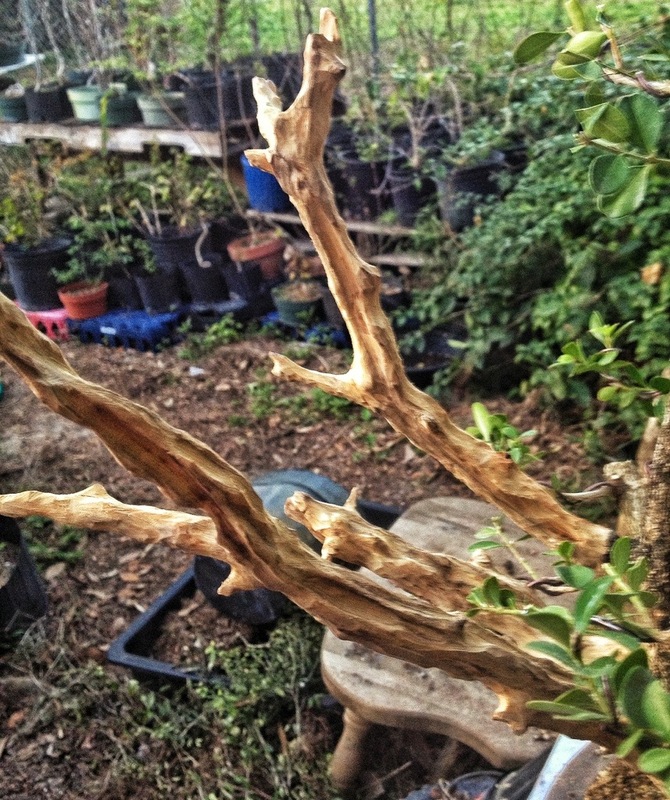 The dead branches (henceforth to be called Jin) were there before. 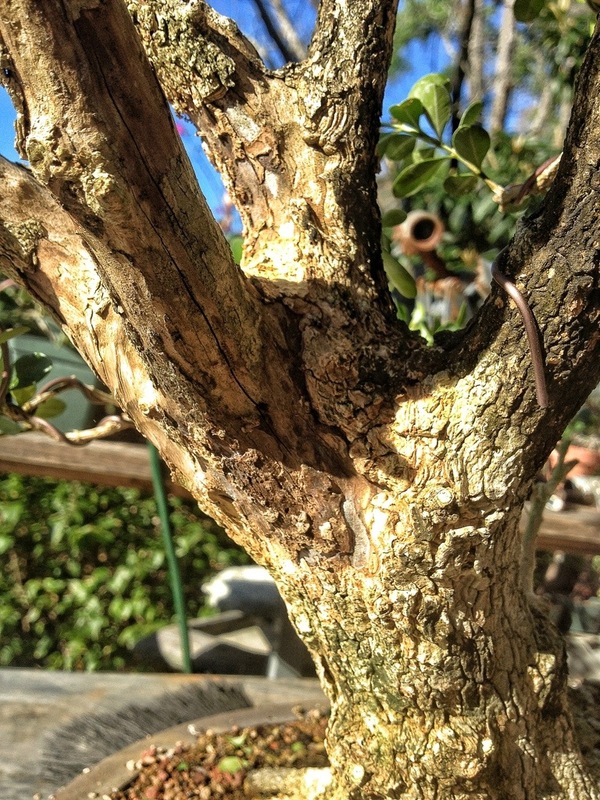 The boxwood is prone to a root fungus which manifests itself by top growth dying back. 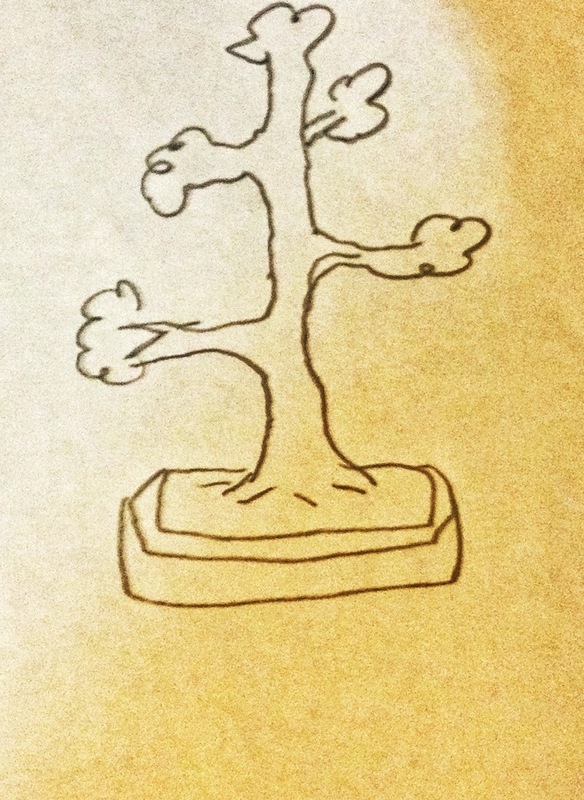 Which is how we got the Jin on this tree. 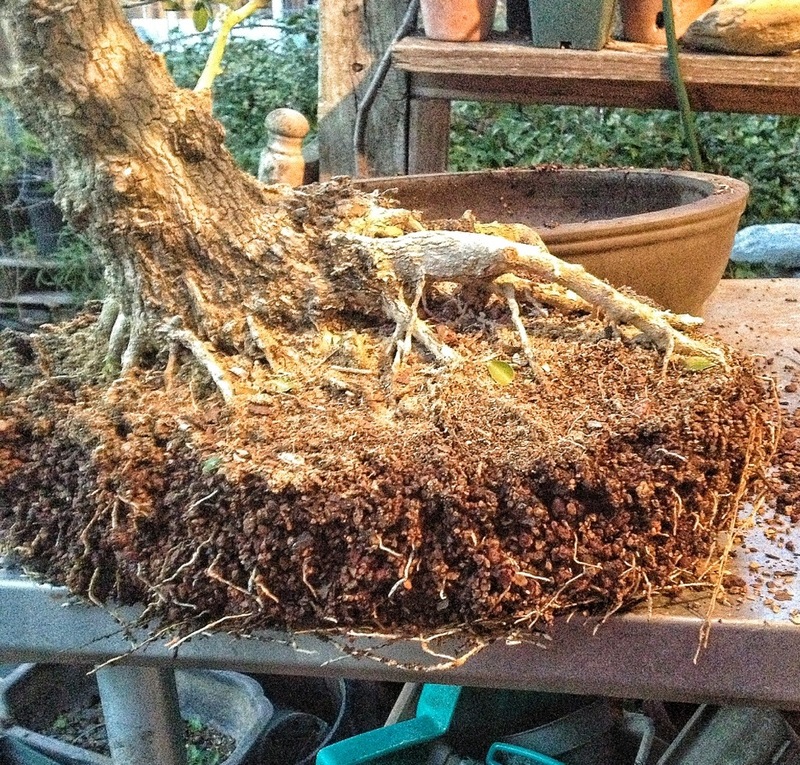 Putting it into good bonsai soil remedies that. 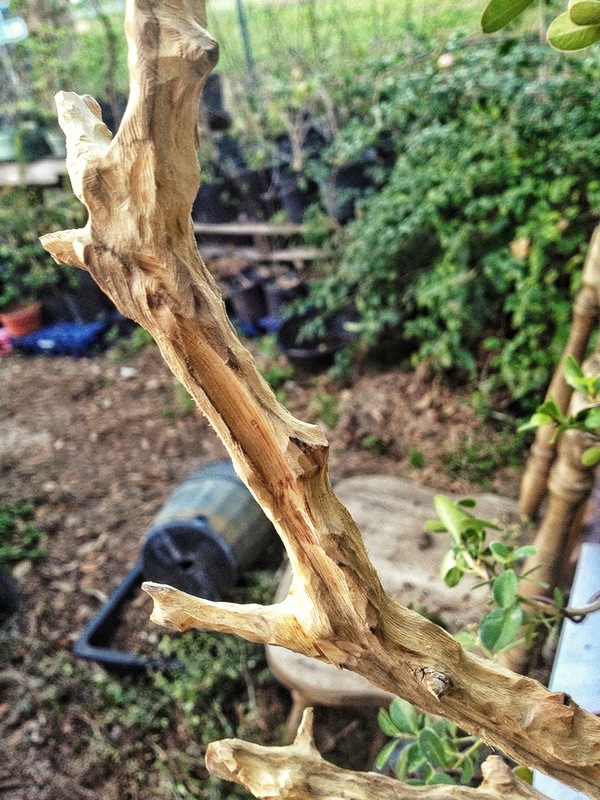 The dead branches give us the opportunity to apply some drama to our composition. It’s early spring, and this is new growth. 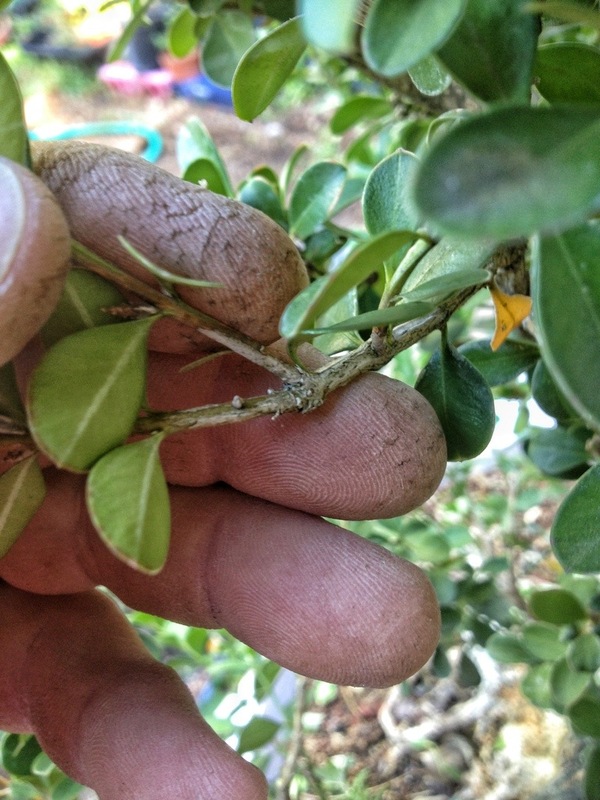 This is the best time to prune it here in Florida. And that is the flower and fruit. The flower is the grey, tan, orange thingy on the bottom; the fruit is the green thingy on the top. Time for the initial trim. 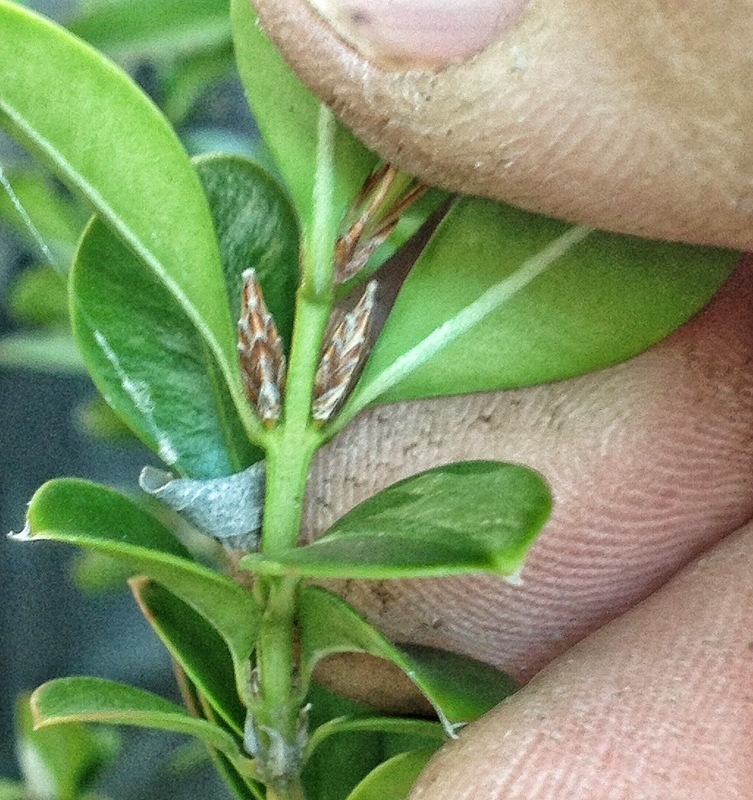 This is typical of the growth habit of a boxwood: three shoots from one spot. Simplify this to two. 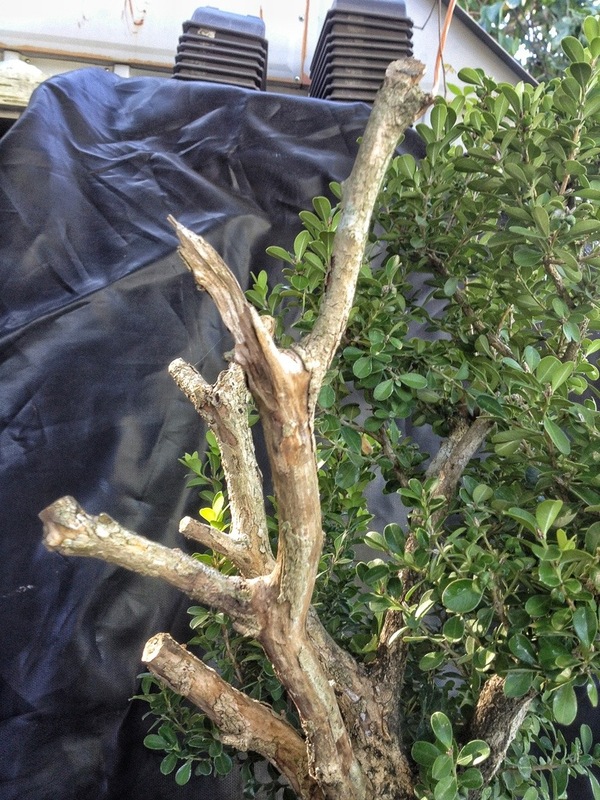 From here its just standard pruning practice. To use what we have means that, instead of cutting to a hard line and using a single leader we try to think in 3 dimensions, building the tree with multiple trunks and treating them as individual trees with their own tops… You’ll see…. Lets move some big branches with some wire. 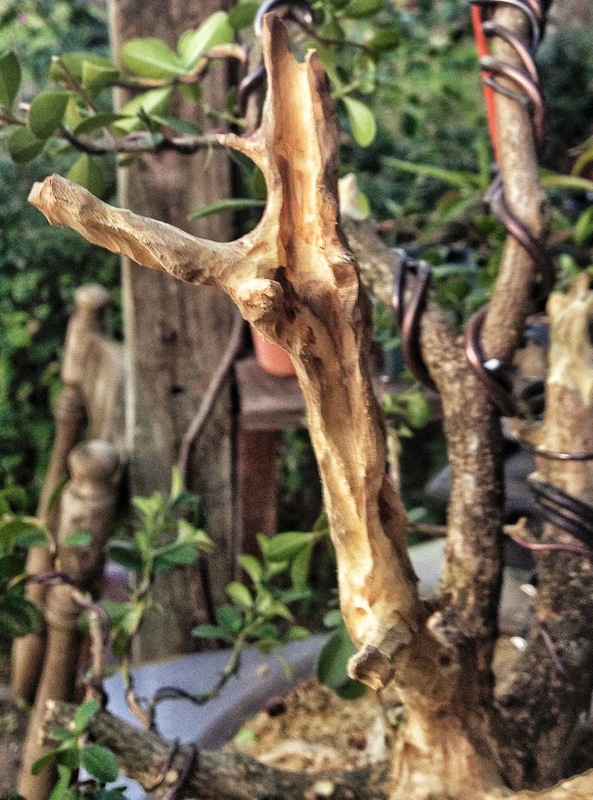 One tip, these branches are very stiff, even if you can move the branch with wire, it may not stay. 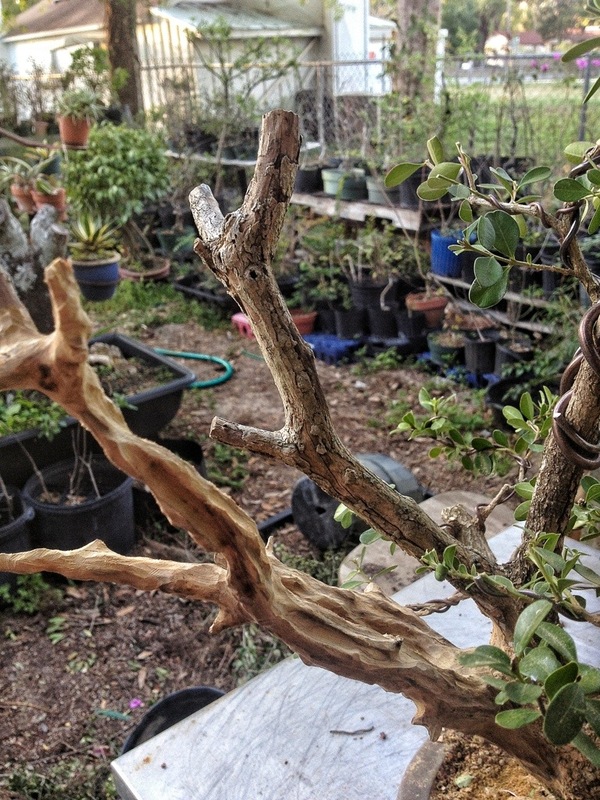 To ensure that the branches stay, you have to make sure that the outside of the bends start to crack, if (on this tree) there is nothing to heal, the interior hard wood core will just bend right back to its original position. 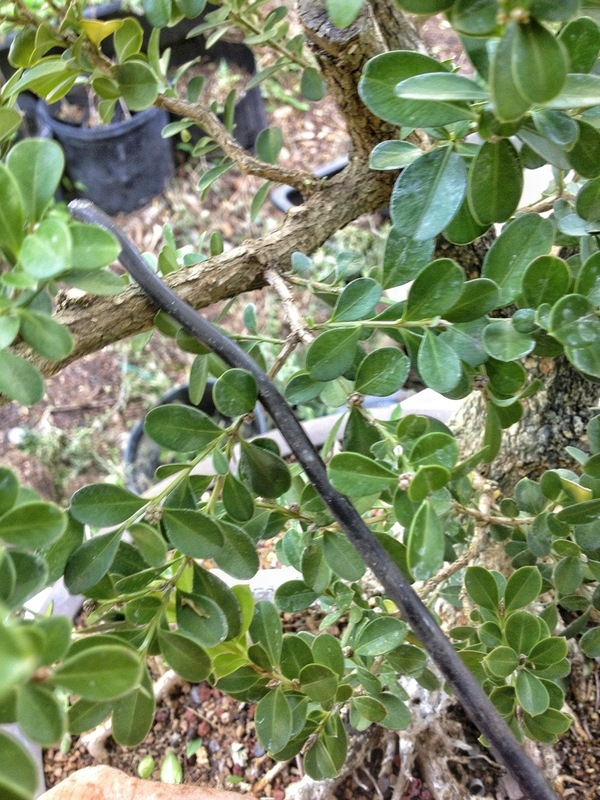 It is not how long wire is on, but the growth, that sets the branches in place. That’s the first go through; cleaned up, to use the vernacular of the trade. 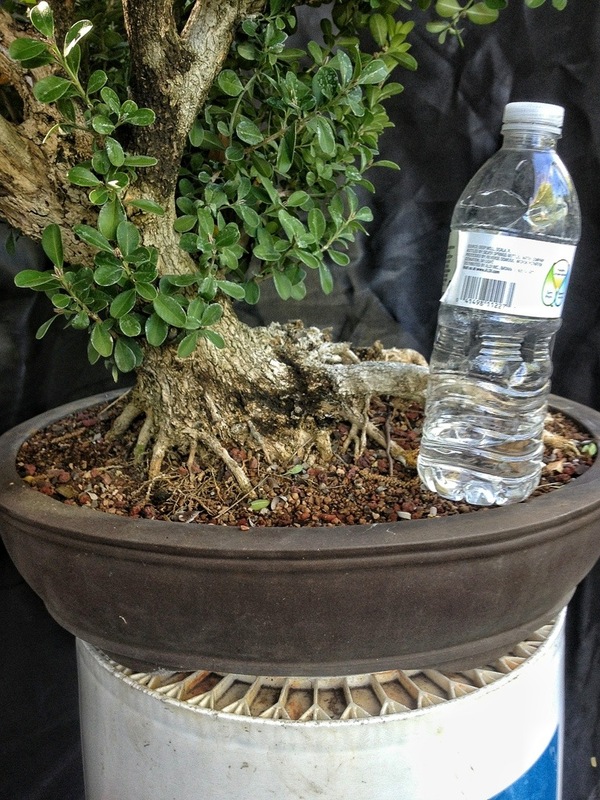 Now, I can’t stress this part enough, never think that the angle and position that a tree is potted into its container will be the best angle or the front. The original potting orientation was good, it was just a bit conventional. The composition as such will move the eye in this way. This is an important aspect in art and design. 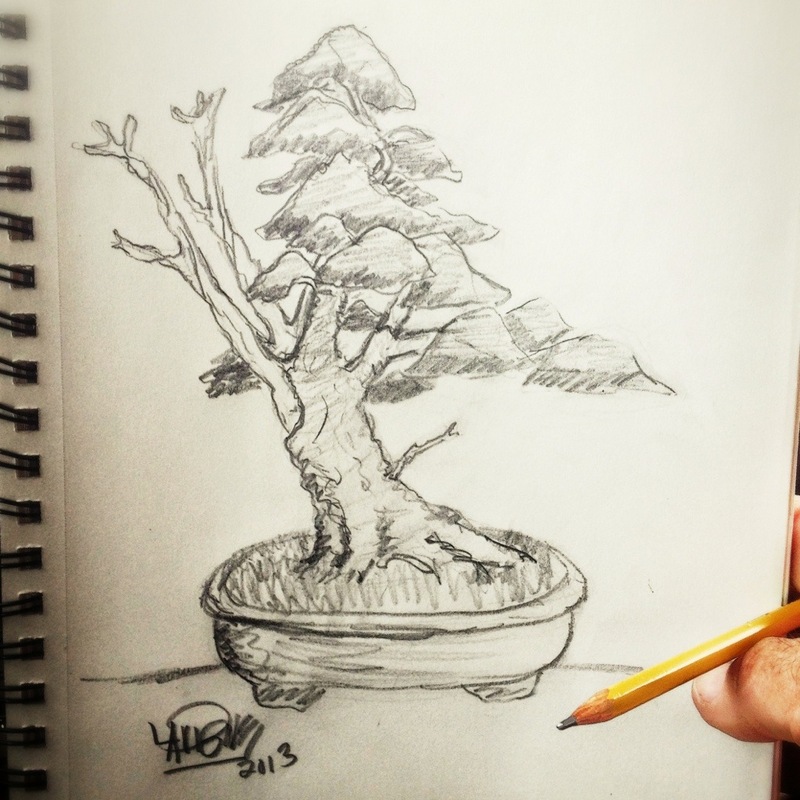 With bonsai it is more difficult because you have the limitation of the medium: a tree that must be alive. One can’t simply put something where it can’t go. It has to either grow or be there already or be able to to be moved into place. Review: above is how we began. 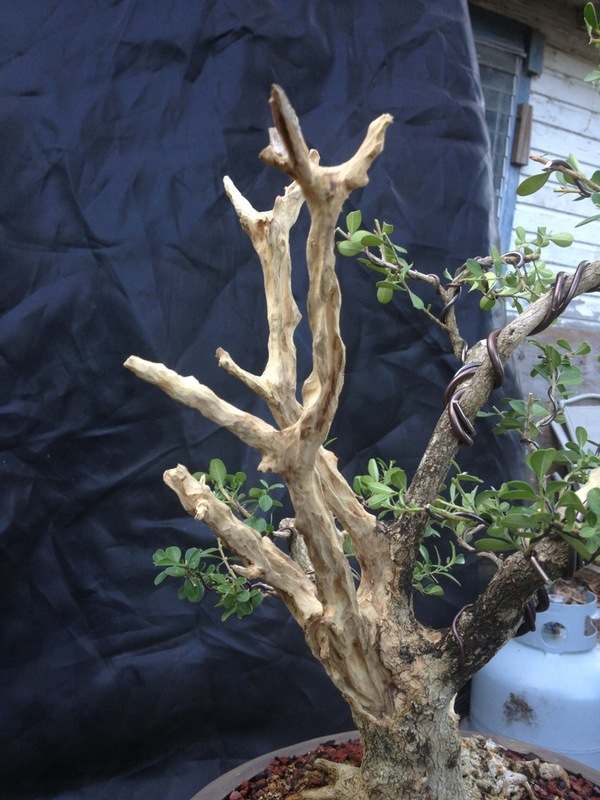 Every branch wired and trimmed. Now for carving of the deadwood. 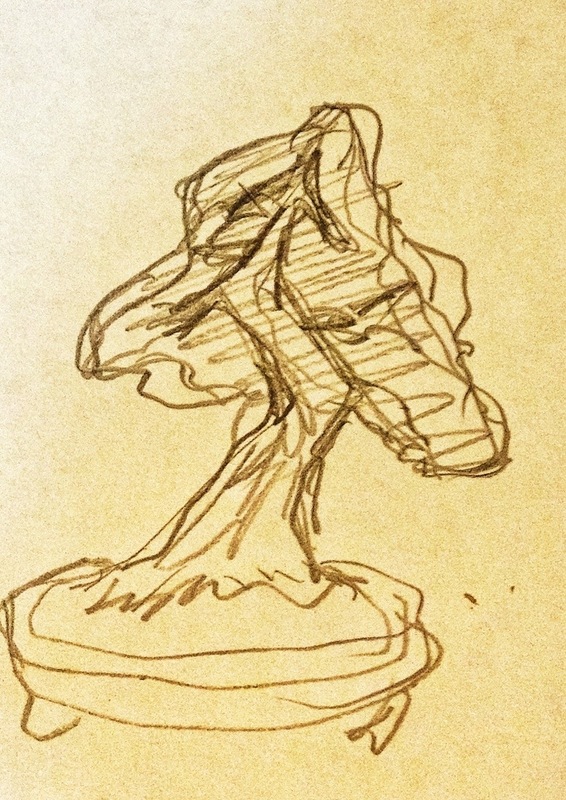 The way I “see” the carving is to imagine water continually pouring down the tree, eroding the softer wood and revealing the dense, hard wood under. I also prefer hollows to sharp sticks. 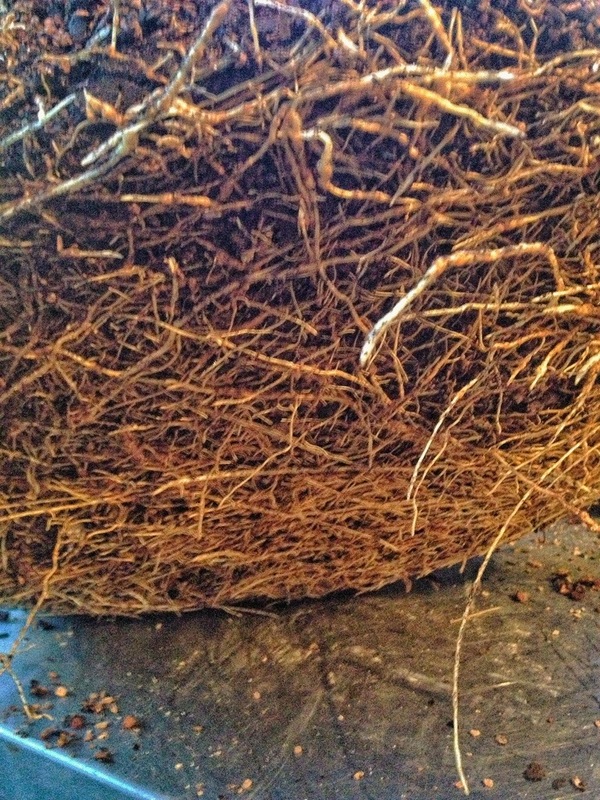 Like I said earlier, the initial potting consists of sawing the rootball to fit, and teasing out some of the exterior roots. you just tease out the bottom and side roots and trim them. 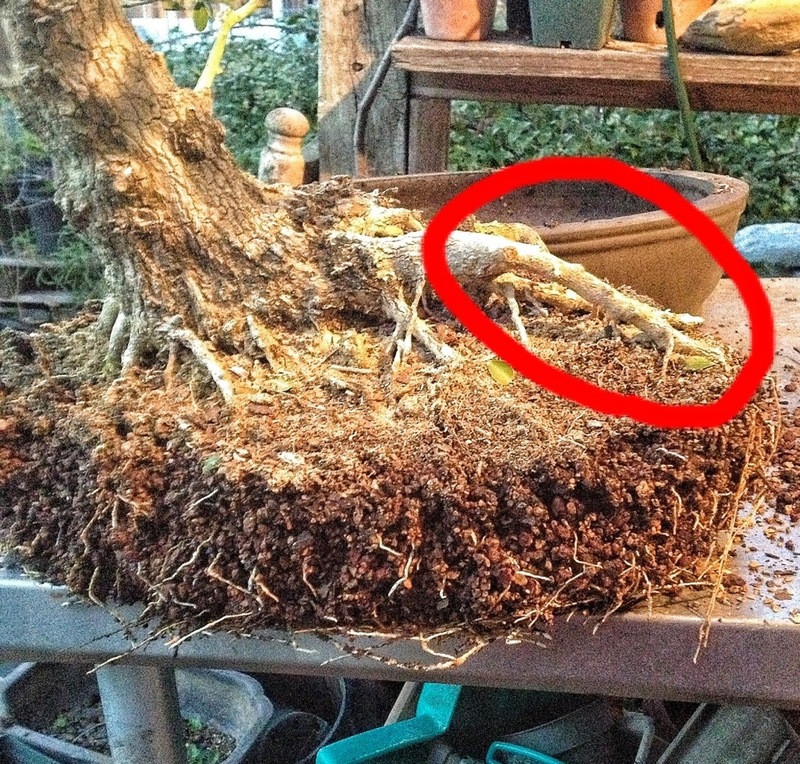 The root mass on a healthy boxwood should be like a brick. If not, you’re repotting too early. Or there’s a disease. I’m rotating the tree clockwise about 30 degrees so the right front corner and the left rear corner have to be cut back. The next morning I took a video and some pics of the finished piece. Which helps you to see the three dimensionality a little better. And I added some really dramatic music for your enjoyment. A photo cannot show the depth and feel that seeing a tree in person. 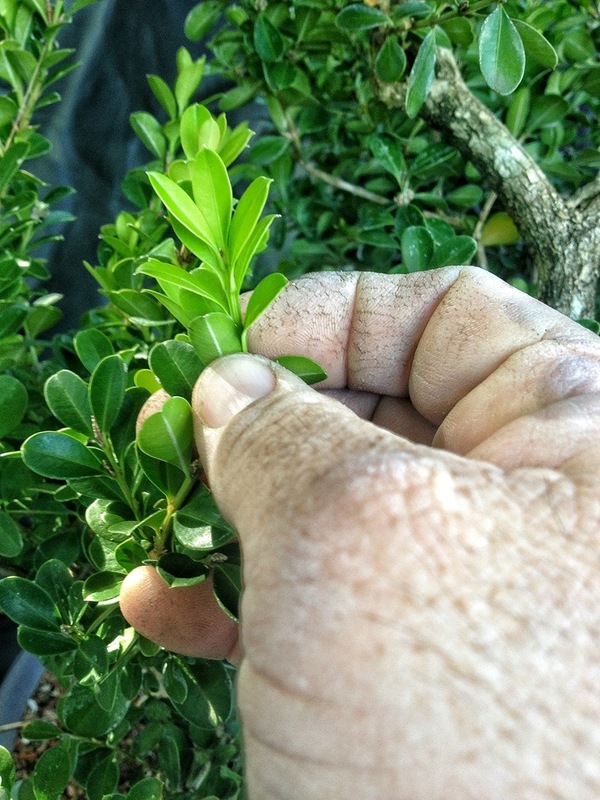 The boxwood is easy to take care of but slow growing. And try to think in 3d. 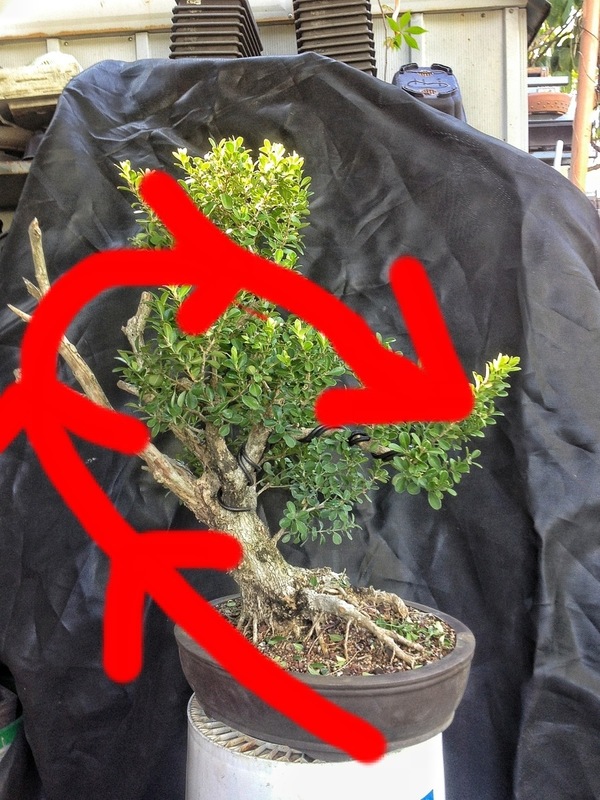 Prev What is a “bonsai tree”? Great post, excellent. Love the video especially the sound track. 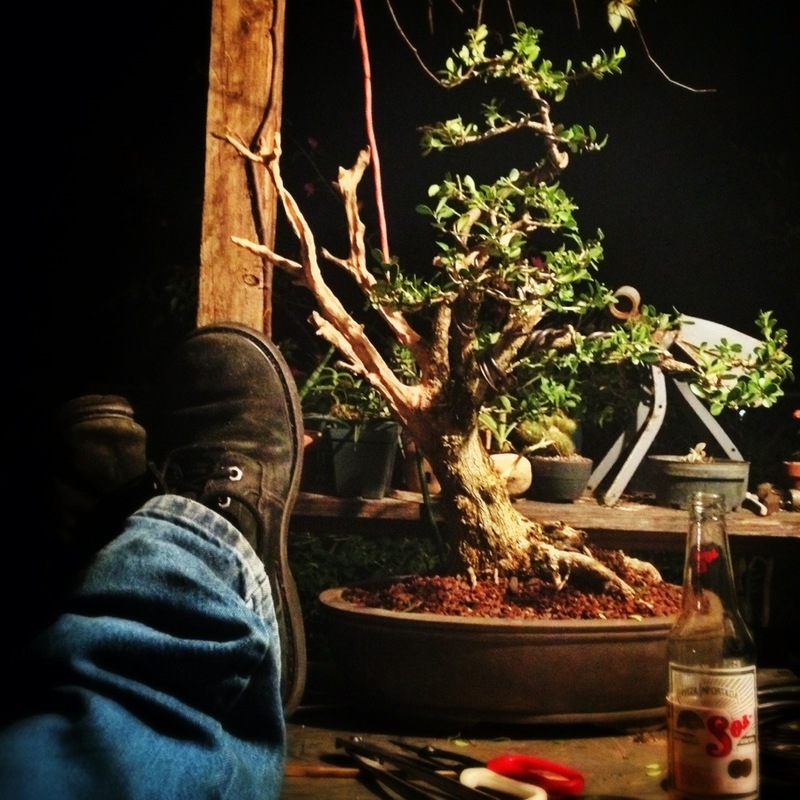 Thanks Adam, you are a bonsai master! Thanks Tommy, I’m not a master yet, I’m still learning but I’m trying to have fun while doing it and hoping that my sharing helps other people learn too. And smile….that’s important. You got that right, we are learning from you. So much to learn. My osmosis works great when the teacher is as good as you are. Thanks for sharing. Great post Adam! Nice to have so many photos and a video to capture the sequence of change. 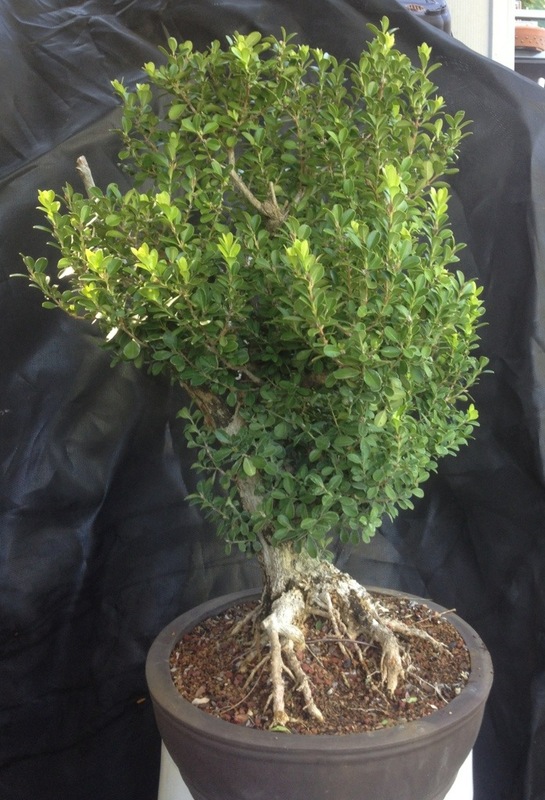 Now I have to grow a boxwood! Thanks for reading Bob. How did you like the music? The music on the video is a “hoot”! I can just picture you walking around the tree being absorbed in the work. I look forward to your posts. Now, we’re whistling “Dixie” !!! 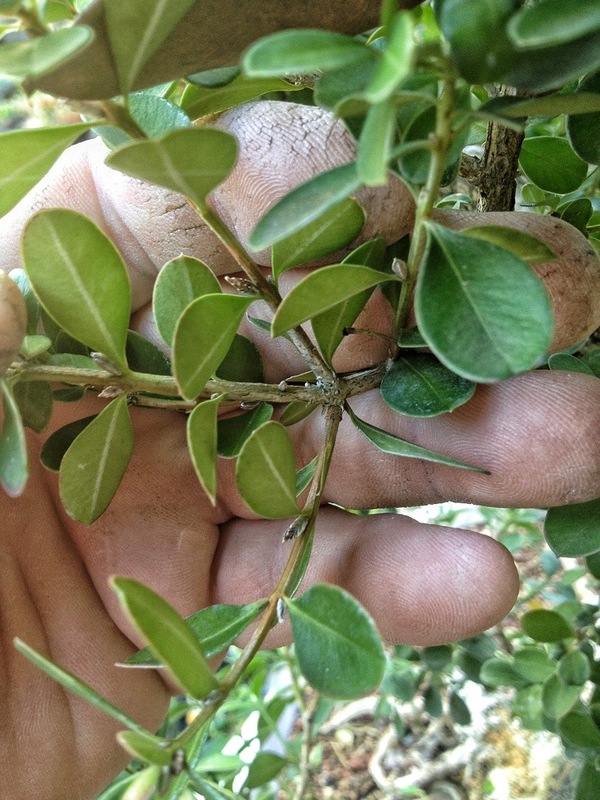 This is some input I’ve been waiting on – some good tips, pointers and ideas for the “commoner” buxus – so far Kingsville’s my favorite micro. Simplifying 3 to 2 branches to control the direction of growth is a good tip that I can apply to any of the boxwoods. 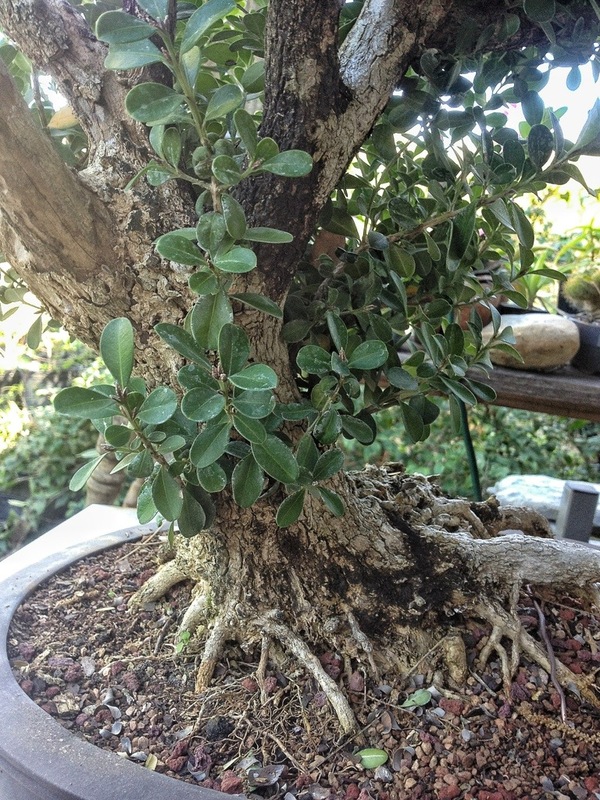 And I like the idea of treating a multi-trunk as separate trees – I’ll try that on a 3 trunk semperverins I’ve been saving. You are working with one impressive old specimen – that must have been saved from the landscapers dumpster – I like what you’ve started. You enjoy tackling the *hunks*. 🙂 Taking the first step is the hardest; maybe it’s time for me to move forward. I got the multi trunk idea from Dan Robinson actually. He’s a great observer of nature and that’s where he got it from. Believe it or not, a big tree is as easy as a little tree, if not easier. There’s more room for mistakes that can grow out. A small tree only has so many branches. Go for it. Adam – another super post. Never been a fan of the traditional use of boxwood: Hedgy, boxy, and flowers that smell like cat pee. Judging from my granny’s garden, served as a roost for flies and wasps, as well. (hey, can 10,000 flies be wrong???) My heart sank when I say the initial pix. I thought ‘god, I hope he does something good with that sawed off bush’, but kept on reading anyway. As usual you did not disappoint. Great final (well to be continued) result. Am going back to sample the video again. Just great. 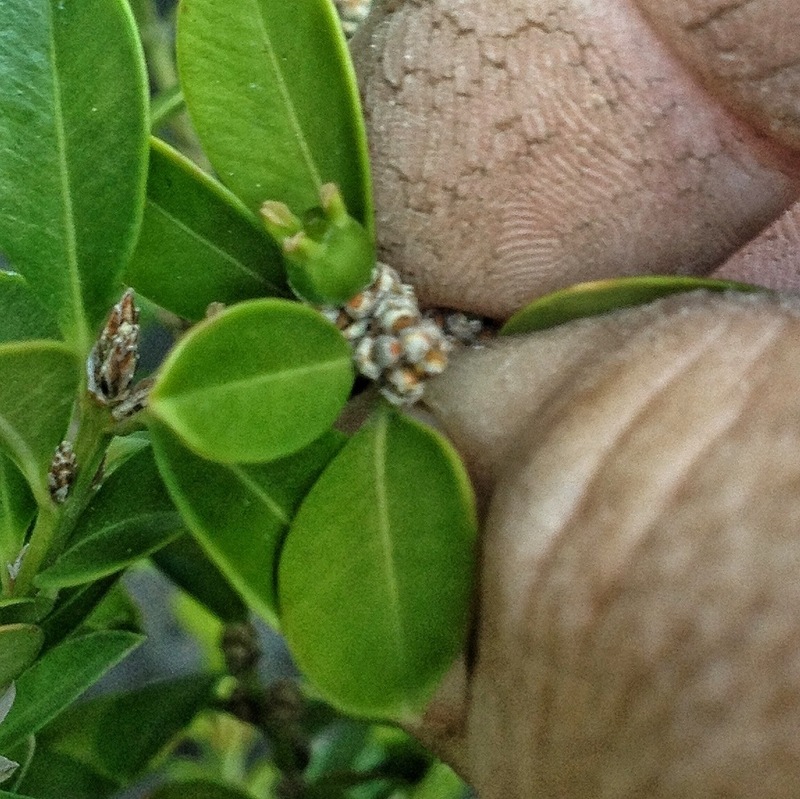 And this coming from a boxwood hater…they still smell, but I see there is hope after all. Thank you Sharon. 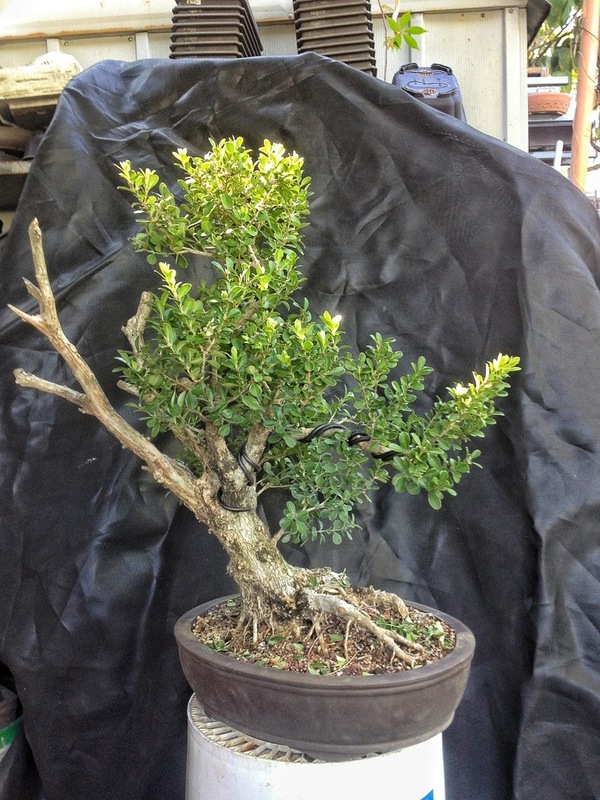 These Japanese boxwoods don’t tend to smell like the English boxwoods. Or so I’ve been told. I don’t smell anything from them myself. 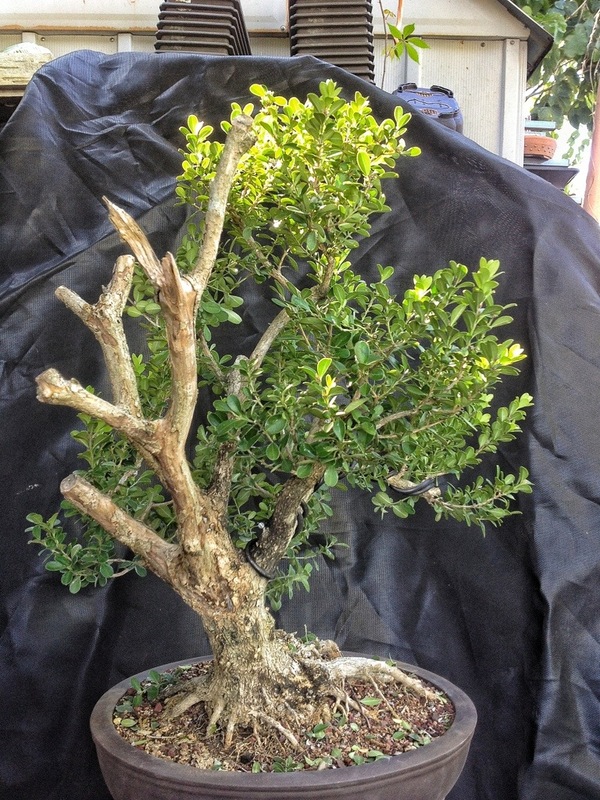 Sorry, did not mean to diss the humble boxwood – they were over used and poorly tended in the ’60s when I was growing up. Also, must have missed the variety cite as Japanese rather than English. My error. Completely awesome video. Music – Very dramatic. Thanks for the tips really useful and helpful.I love what you did with it. The after shot of the tree is beautiful. Do you have an update on how it looks this year? Would be great to see. Thanks again. 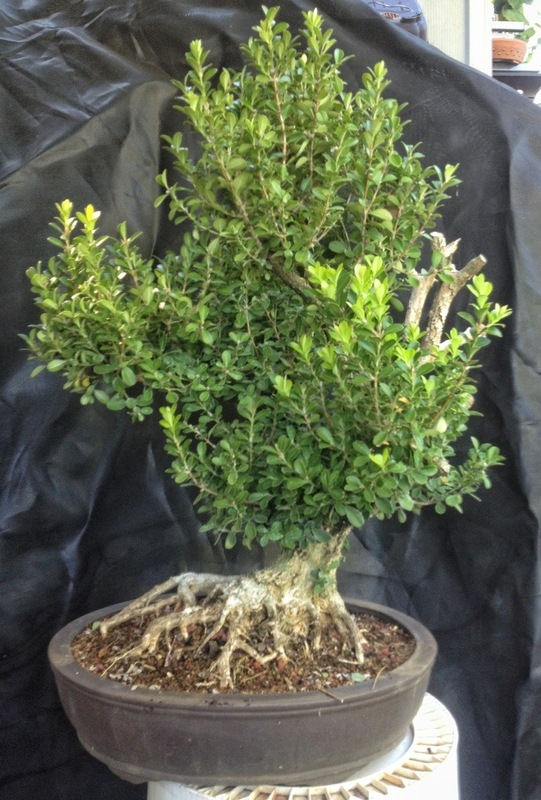 Can I make a hedge of boxwood but leave the trunk bare for the first 3-4 feet and then a regular like hedge on the top? I have a old home with a great low fence that I want to show off but need a hedge to give privacy. I don’t see why not. 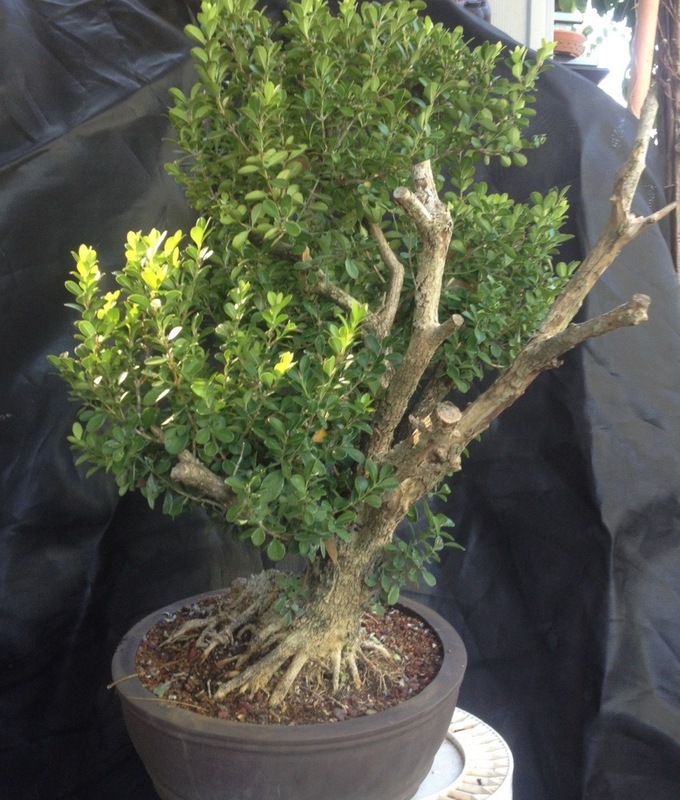 But you’ll have to use one of the tree sized boxwoods, Japanese boxwoods like this one don’t get big enough for what your thinking of doing. You’ll have to find a landscape nursery that carries them. The most famous nursery in the US that deals in them is Saunders Brothers. 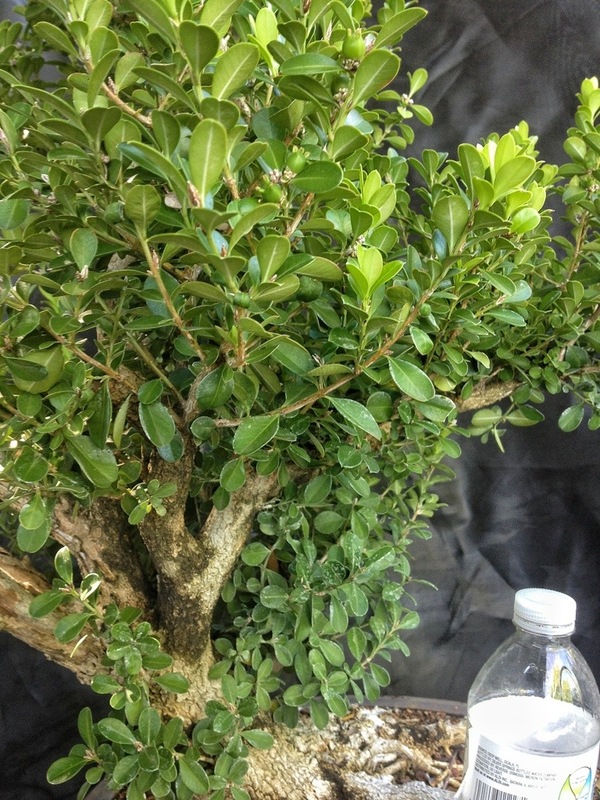 Adam, was wondering how this Boxwood is doing today? 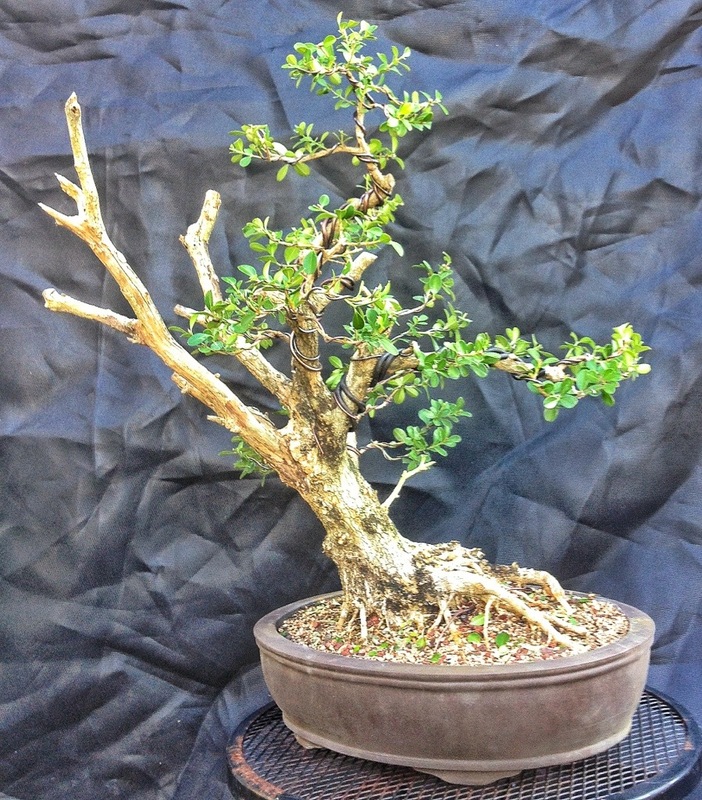 I have a similar large old(30 -40 year old) landscaping boxwood that I dug up 2 years ago and transplanted to a shallow bin with bonsai soil. 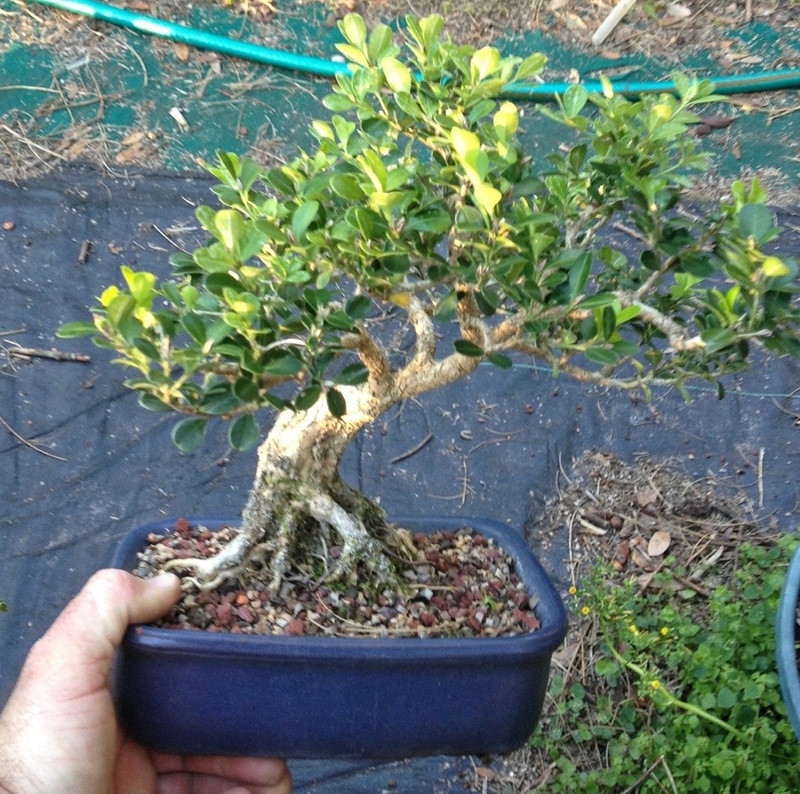 This weekend I repot it into its first true bonsai pot and am wondering about how much to cut back the foliage. You seem to have cut this one back extensively and was wondering how it was doing today? Thanks in advance!! Great box article. I’m new to bonsai so this helped very much. Thank you. Especially loved the dramatic music to the video. I want it for a ring tone. Lol. Thanks again. Alternatively I could keep it as a regular garden plant for a year or two in my own garden. 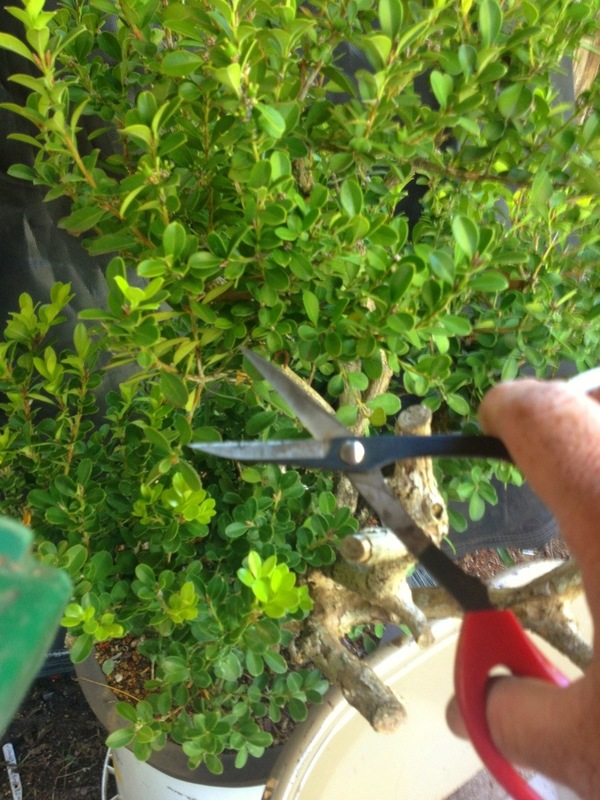 It’s always best to keep some green foliage on a branch when cutting it back. In your case it may take several years to chase the green back closer to the trunk. Just have patience and don’t rush it. It sounds like a good challenge. Good luck!